Before posting about HOSP trapping and disposal, please review our forum guidelines. I found this forum on the other site, and have been following it for a while. I bought my trap about mid-summer, and have caught 115 so far… And I have a LOT more to go. So, my question is… Does anyone keep their traps out in the winter in Northern Ohio? I’m still getting one or two a day, but keeping decoys is not going to be possible as the weather cools. I read through alot of the posts on the other site, and it seemed that everyone put away the traps as winter approached. I don’t personally, but I know there are some who say winter is a really good time for trapping. My issue is with keeping decoys alive, or having to go outside in a raging blizzard to service the trap. I’m not into being cold! Hi, Chris. I’m from NW Ohio. I agree it is hard to keep decoys alive during the winter and monitoring the trap isn’t fun either. I don’t have my trap out right now but normally I have it out late fall into early winter and then sporadically through the rest of the winter months. I either cover the trap at night with an old heavy quilt or I bring the trap into the garage at night. Even then though the decoys just don’t last very long. Try covering it with something heavy and see how long the decoys live. I think it’s better if the trap is on the ground because the ground kind of insulates it and the cold air doesn’t surround the entire trap. Does that sound logical? When there’s snow I don’t bother trapping. Now you make me want to get my trap out again. 115 is a great number!! Congratulations. I know I will have to change how I trap as winter moves in. And we are expecting 1-3″ of snow tonight and tomorrow. I’ll just pull it when the weather turns bad… And I don’t mind the cold weather that much. It’s just part of winter in this area. I don’t try to keep decoys overnight in the cold weather. Maybe it’s possible if I brought it in to the garage, as at least they would be protected from the wind and some of the cold. Your idea of an old quilt might work too, but right now, I’m starting each day with an empty trap. 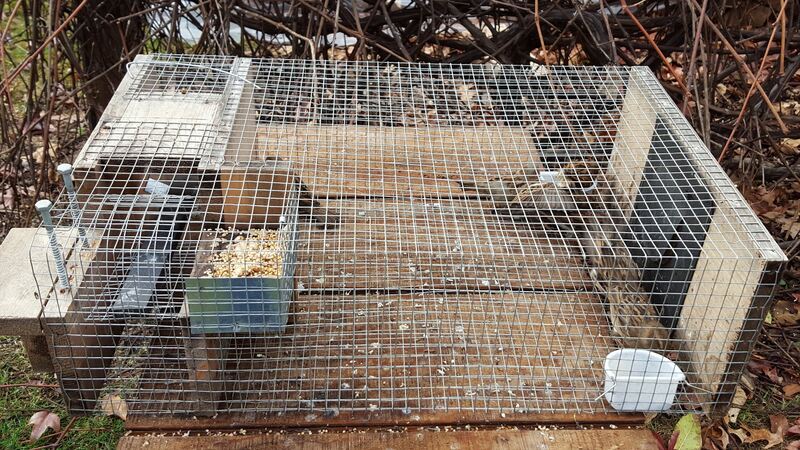 I’ve been trapping them with the trap set on a couple of concrete blocks with a small sheet of plywood underneath, and it has seemed to work good, at least in the warmer months. I’m still catching one a day, so I think I’ll keep it where it is. I tried setting it near my feeder, and caught none, as they were more interested in the feeder. I moved it to an area near where they perch, and started catching them. What? We are going to have 1-3 inches of snow?!!! I didn’t hear that. My husband is the keeps me updated with the weather and he forgot to tell me! Bummer. We are from the Toledo area too. I haven’t tallied my catches this year. I was a little not as motivated to catch this year as I was in previous years. Depends on where exactly you are, as we are going to be right on the rain/snow line. The NWS has backed off on the forecast now. North of Toledo, Monroe County has a winter weather advisory up, with 1-3″ predicted. Now looks like 1-2″ for Toledo. The past few weeks have been a little weird with my birds. Some days, they devour the food, and the next, the feeder isn’t touched… Probably has something to do with the warmer than usual weather we had been having. Counted 10 bluebirds in the meadows of Secor Metropark last week. Flocking up to head south is my guess, although there are usually a few at that park year round. 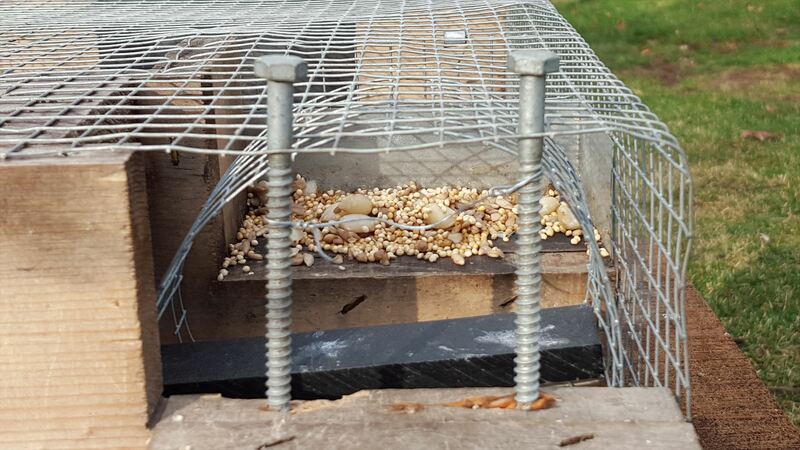 On the trap front, I’ve pulled it for a few days, as I have a squirrel that is robbing the food. I tried to put a screw in the front of the trap, but he has actually bent some of the wire trying to get past the screw… I seem to go in spurts on catching too, as I’ll get nothing for a few days, and then catch 3-4 the next. Been a dry spell for a while…until this morning… I put out the trap about dawn, and caught 6 within an hour. It’s cold(29 degrees), clear and real frosty here this morning, and they can’t seem to get enough food! I’ve had squirrel problems too. I finally put two screws in the front, and put a wire about 3/4 of the way up between the screws. Caught two sparrows, so I know they will still go in, and I watched the squirrel get frustrated trying to get to the food, so I know it works for that too! I know this is hard to believe….but I do not have any squirrels at this house! I don’t know what I’d do about trapping if I had squirrels. I do have a chipmunk that thinks I’m feeding him though. And I’ve caught mice too. I SO need to trap but now I’m going to be out of town so will have to wait. I’m just plain lazy!! Maybe sometime you can show a photo of your squirrel proofed trap? Here you go. Nothing fancy, but it does work. 7 HOSPs in trap so far today (as well as a Junco that I got out early this morning…). I have the trap set on a garbage can near where they tend to sit during parts the day waiting to fly up to my feeder. The second pic, the trap is turned 90 degrees. I use an old piece of plywood for the bottom. I did this to my older trap after a MODO got it’s head and shoulders through the entry flap, and its body stuck in the elevator compartment. I had to practically destroy the trap to get the dumb thing out! Ended up with 9 HOSPs today and 6 yesterday. Saved one as a decoy today. I have a small hedge in my yard, and I counted 40 in there yesterday. Guess I thinned them out some the last few days. I didn’t see the wire until now. I’m glad you found a solution. I get MODOs in the trap all the time! If I don’t see them right away they get bloodied up a bit but usually I find them quickly.